Join us at MCASB for the Member Reception celebrating the opening of two new exhibitions, Cecily Brown: Rehearsal and Bloom Projects Exchange Series: Midori Hirose, Of the Unicorn (and the Sundowner Kids). 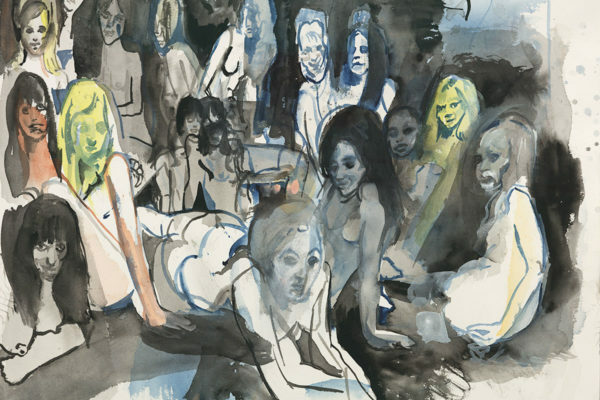 Cecily Brown: Rehearsal, curated by Claire Gilman, Senior Curator at The Drawing Center, is the artist’s first museum show on the West Coast and the first exhibition dedicated to her drawings. Arranged thematically, the more than eighty small drawings, large-scale works, and sketchbooks on view will foreground Brown’s iterative reworking of motifs from her wide-reaching arsenal of source material, which includes prints by eighteenth-century draftsman William Hogarth, pages from animal clip-art books, and the cover of Jimi Hendrix’s 1968 album Electric Ladyland. Bloom Projects Exchange Series: Midori Hirose, Of The Unicorn (and the Sundowner Kids), Midori Hirose’s first solo museum exhibition, is presented in collaboration with Portland Museum of Modern Art (PMOMA). The room-sized installation of newly-commissioned sculptures traces her explorations into the mythologies, historical accounts, ecologies, and communities of Santa Barbara, CA which unfolded from a series of conversations and excursions with local residents over the course of Hirose’s multiple visits to the area.